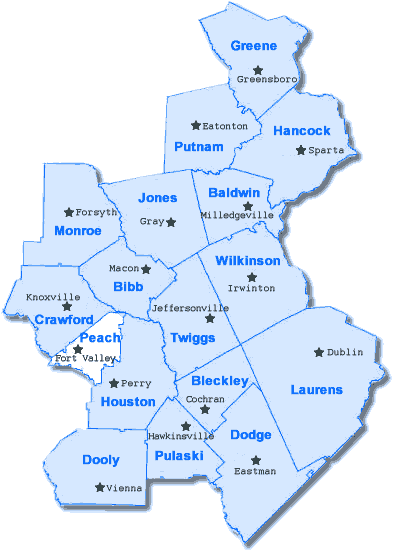 Founded in 1924, Peach County was the last county formed in Georgia and is home to Fort Valley State College and the Blue Bird Corporation. The Blue Bird Corporation is the world's largest producer of school buses. The national headquarters of the American Camellia Society is located in Peach County with acres of camellias and a museum with over 300 porcelain birds at Masse Lane. In the early 1900s, Peach County was the peach capital of the world and today it is ranked #7 of all the counties in the nation for the production of peaches and #5 for the production of pecans. Peach County is a regular stop for tourists for peaches and pecans. Are you relocating to Peach County GA? Get your FREE relocation package!